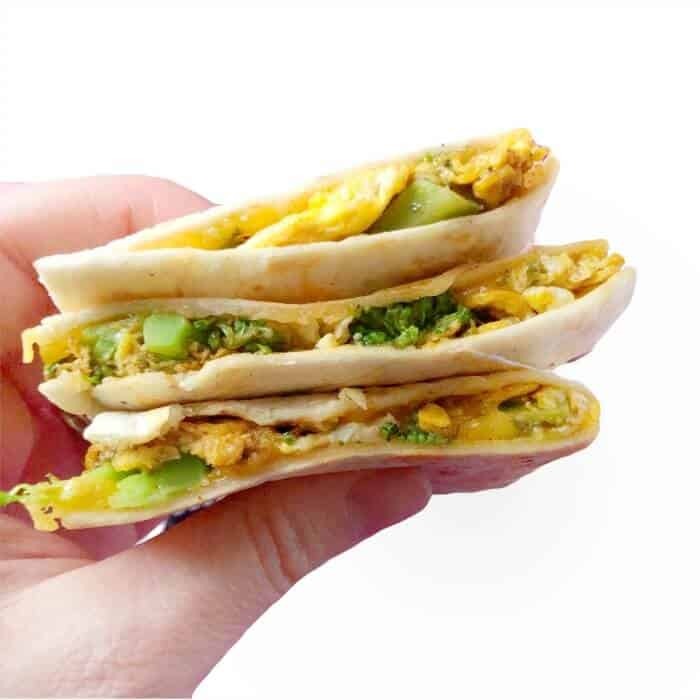 Try something new for breakfast this week with this super delicious broccoli cheese breakfast quesadilla recipe. These quesadillas are a sneaky way to get a serving of green into your kids before the day even starts! These breakfast broccoli cheese quesadillas also reheat well for quick breakfasts all week long. If you’re looking for something fun and green to serve your kid for St Patrick’s Day, this recipe also works especially well with spinach tortillas for a fully green breakfast. Broccoli tends to be a vegetable that I find most kids either love or really don’t want to try. My kid used to not be a big fan of broccoli and it took many many many times putting it on her plate before she came around. I think I blinked and the whole family was looking at me with a look that says “can we have this dish tomorrow too.” My husband slyly asked if I would be making a video for this recipe, knowing that it meant he could grab up the leftovers. To cook a breakfast quesadilla you start by cooking the filling first. In a small pan, you’ll soften the vegetables, then add the egg and cook. Remove the egg and broccoli mixture from the pan, wipe out the pan. Then you’ll addthe torilla back to the pan and fill it with cheese and the egg and vegetable mixture. The gooey combination is delicious! If someone in your family is an especially picky eater, I would consider chopping the broccoli a little finer as that will help to make sure it is easier to eat within the quesadilla. How much you cook the broccoli depends on your family. We like our broccoli to still have a little give to it, roasted is our favorite way to eat broccoli. For super picky kids and small toddlers, sometimes extra soft broccoli makes it easier to eat. Have a picky eater? Join my On My Kids Plate Facebook Group for more recipe ideas and support! While I don’t think this breakfast broccoli cheese quesadilla recipe is especially sneaky, it is a great way to add a serving of vegetable to a meal. These quesadillas will stand up on their own as a weekend breakfast, if you make a few extra they will reheat well. We have also been known to make these breakfast quesadillas for dinner, as eggs cook up quickly for a really fast and quick meal! These broccoli cheese breakfast quesadillas are the perfect vegetarian recipes for kids. This meal is easy, and perfect for picky eaters. .5 cup chopped broccoli Dice up this broccoli a little finer for a better end texture. Mix all spices in a small bowl, set aside. Add broccoli to the pan and let cook for 3 minutes while moving broccoli in the pan. Add all spices to broccoli. Add water to the broccoli. Cook broccoli on high an additional 1-3 minutes or until softened and water is mostly gone. Turn burner to medium heat. Add scrambled eggs to the pan. Allow eggs to cook most of the way through before moving them into the pan to finish cooking then remove everything from pan. If there is egg stuck to the pan, remove before continuing. Add a tortilla to the hot pan. Then add a layer of shredded cheese, followed by a layer of half of the cooked egg mixture. Add a second sprinkling of cheese, then a second tortilla to the top. Cook quesadilla for 2-3 minutes on each side until the cheese has melted and the tortilla is lightly browned. Repeat for the second quesadilla! Chop the broccoli up well in this recipe for kids who have trouble chewing broccoli. Softening the broccoli by cooking an extra minute or two can also help. Frozen broccoli can easily be substituted, but broccoli water will likely need to be reduced. I’ve made this recipe to make only a small amount of these breakfast broccoli cheese quesadillas, as it’s something that is easy to throw together as a last minute meal for one or two people. Don’t hesitate to go a little bigger and have leftovers, breakfast broccoli cheese quesadillas taste delicious the next day too. Maybe my eyesight is really worse than I thought, but I don’t see eggs mentioned in the ingredients. You mention cracking eggs in the instructions. How many are needed for this recipe? Can you prepare the filling the night before? You totally could prepare the filling ahead, though I might wait to melt the cheese until the day of if you like it gooier. 🙂 We prepped a few and ate them for breakfast all the way through and reheated them in the toaster oven and they tasted yummy also. Hope you try them!